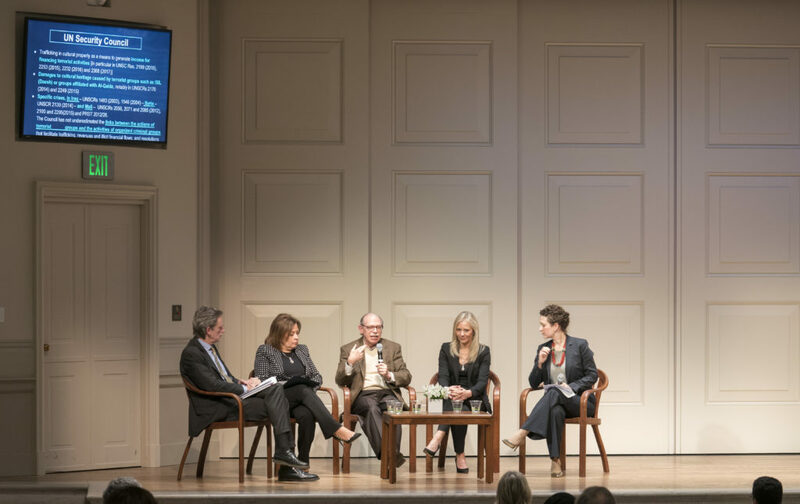 On February 23, the Antiquities Coalition co-hosted an event hosted at the Freer Gallery of Art entitled “Culture at Risk: Yemen’s Heritage Under Threat.” This event convened experts from across the globe to discuss threats posed to Yemen’s rich cultural heritage from armed conflict, violent extremism, and cultural racketeering. AC Panel on ‘The Response of the US and the International Community to the Crisis’, featuring (From the Left) Judge Luigi Marini, H.E. Ambassador Bughaighis, Ambassador (ret.) Feierstein, Deborah Lehr and Tess Davis. The event opened with illuminating details about Yemen’s heritage and its immense value to humanity. Yemen has a diverse cultural heritage that extends back to the incense trail of the South Arabian kingdoms and over a millennium through a flourishing Islamic era. The remains of this heritage, tangible and intangible, are visible today, such as monumental buildings, sculpture, coins, gold and silver artifacts, and inscriptions to linguistic diversity, manuscript production, costume, poetry, and dance. This priceless cultural heritage is under threat. Archaeologists, art historians, and specialists in heritage preservation spoke at great length about cultural destruction and looting in Yemen as a threat to history, human rights, national economies, and global security. The Antiquities Coalition was proud to moderate the final panel which focused on the U.S. and international community’s response to these threats. This panel convened officials from around the globe, from the Permanent Mission of Italy to the UN to the Ambassador of Libya to the former U.S. Ambassador to Yemen. These current and former government officials discussed legal and policy tools that can be implemented to stop cultural racketeering in Yemen. Click here to learn more about how the Antiquities Coalition is taking steps to combat looting in Yemen and stop the illicit trade in Blood Antiquities.